Choose your helicopter tour below. Swimming holes, waterfalls, ﬁshing locations and tropical farmland; these are just parts of the adventure experiences waiting for you when you take a Kununurra helcopter flight. Some flights include landings to view the sun setting over the vast red cliffs of the Ord River, to fish in a wild river, or swim in secret springs. Choose a short flight or a longer itinerary with multiple remote landings. A helicopter flight over the Mitchell Falls and the Kimberley Coastline provides stunning views of this beautiful, remote area. Our flights depart from the Mitchell Falls campground from April to September. Choose from a 6 minute Transfer flight, which is an exciting way to view the spectacular four tiered Mitchell Falls and surrounding area from above as well as not having to walk one way. You can take a longer 18 minute or 48 minute flight to the Kimberley coastline and still be dropped off or picked up at the Mitchell Falls. Nothing beats a helifishing trip out of Kununurra. There is no easier or productive way to barra fish than in a chopper with a pilot who knows the hot spots and by using Kununurra as a comfortable base. Experience some incredibly diverse locations ranging from saline coastal flats, floodplain and barrage systems, billabongs and spectacular gorges and best of all, catch lots of barra. Choose from a half day, full day or 3 day package. In the remote Kimberley region in the north of Western Australia is a gigantic fresh water lake nestled amongst an ancient weathered landscape. Fly low and watch as the slopes and troughs stretch far and wide, while you and your family look on in comfort. You can be assured of magniﬁcent scenery and a sense of peaceful isolation, whilst we at HeliSpirit take care of your safety and convenience. A secret swimming hole for an idyllic picnic is the cherry on top! Experience the rush of a helicopter ride over the vast chasms of Katherine Gorge in Nitmiluk National Park. Feast on an aerial view of the mighty, magniﬁcent gorge system and the extensive Arnhem Land Plateau. Choose from 6 helicopter flights ranging from 8 to 45 minutes duration, allowing extraordinary views of the river system, waterfalls and deep gorges. A photographer’s delight! Although there are many ways to experience the diversity of El Questro, few experiences can compare to a helicopter ride. Click on the image below to choose the helicopter flight for you. 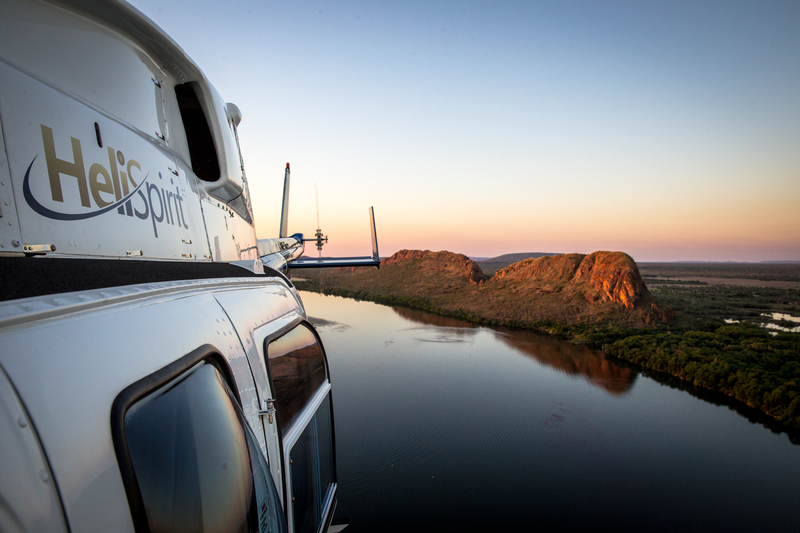 All-inclusive luxury helicopter safaris are the ultimate way to explore the Kimberley. From the inland rugged mountain ranges to the stunning coastal areas. Land at waterfalls, rock art galleries, fishing locations and stay at unique luxury lodges, dining on exquisite fresh cuisine.